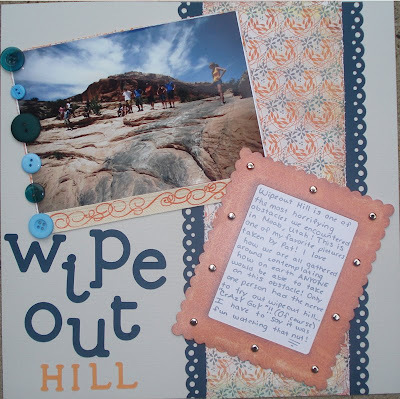 "Wipeout Hill is one of the most horrifying obstacles we encountered in Moab, Utah! This is one of my favorite pictures taken by Pat! I love how we are all gathered around contemplating whether or not to take on this obstacle. Only one person had the nerve to try out wipeout hill...."Crazy Guy"! (of course) I have to say it was fun watching that nut! I filled out MAD APPLICATIONS....yes I said "MAD"....it's true though! Fingers crossed that I hear SOMETHING from ANYONE! At least then I will know that all these efforts were not for nothing! OK gotta get some rest! "i am a mile from end to end, yet as close to u as a friend. a precious commodity, freely given, seen not on the dead, but on the living. found on rich, poor, short, and tall, but shared with children most of all." Love the scrapping :) Good luck on the job hunt, I know you guys will find something soon!